The Congressional sequestration tentacles are reaching further into the fiscal year forcing changes and cuts even in the military. The Navy is cancelling “Navy Week” in Tampa. Citing the “current budget environment,”the port visit by the USS Halyburton and the Blue Angels air show at MacDill Air Force Base have been cut. Without those elements, there’s little left of the Navy Week program. So, it was officially cancelled. A billboard in Brandon, FL. 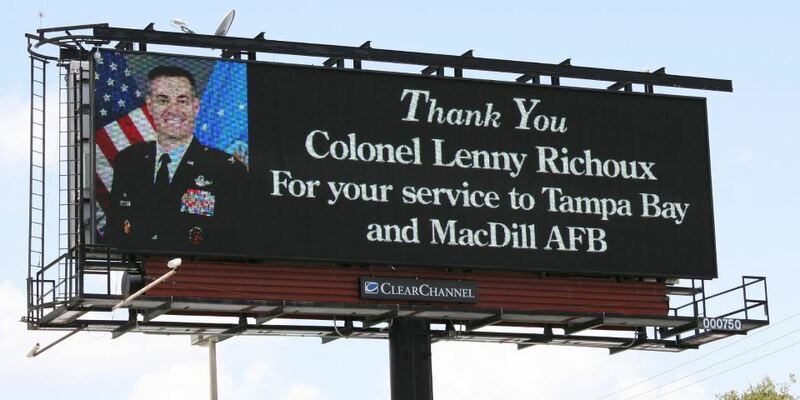 Col. Lenny Richoux was certainly a popular commander when running Tampa’s MacDill Air Force Base. He started a friends of MacDill program to encourage civilian members of the community to visit the base and get to know its work and people. Richoux also worked to expand services to military families, about 80 percent of them, living off base in communities such as Brandon. So, it’s no wonder that this billboard appeared in Brandon. I don’t know who sponsored the billboard, but you hope Richoux and his family have a chance to see it before flying off to Belgium, their new post. And a welcome to Col. Scott DeThomas, a friend of Richoux’s, and the new MacDill AFB commander and leader of the 6th Air Mobility Wing. Photo courtesy of Aviation News in the Raw. 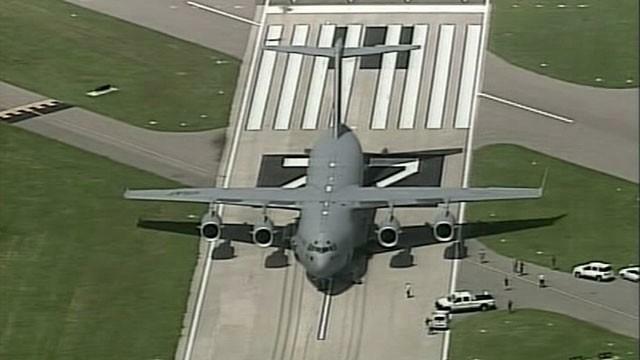 An Air Force C-17 Globemaster cargo plane carrying 23 passengers and19 crew made an unscheduled landing at Tampa’s general aviation airfield, Peter O. Knight Airport on Davis Islands just south of downtown. Video of the landing courtesy of Ryan Gucwa can be seen on the website Aviation News in the Raw. The runway at Peter O. Knight is much shorter than most military landing strips, at only 3,400 feet, and used mostly by small private aircraft and helicopters. The runway at MacDill AFB is 14,000 feet long by comparison. The military aircraft’s planned destination was MacDill Air Force Base, about four miles south at the end of Tampa’s peninsula. The aircraft, flying in support of U.S. Central Command, was apparently undamaged and there were no injuries. There appears to be no damage to the airfield. The civilian airfield officials and the Air Force are working together to move the C-17 Globemaster so that Peter O. Knight airport to re-open. The Air Mobility Win Command is investigating the incident. A still photo taken from the security camera video that captured the attack in the upper right corner. A grainy black and white video of the attack of a soldier walking along a South Tampa street went viral. National news media picked up on the story of the lone soldier whose car had broken down being approached by four young men, beaten and robbed of his wallet and cell phone. The attack so outraged the community that private donors contributed $16,000 in reward money for information leading to the capture of the attackers. Just over a week later, Tampa police have arrested a third teenager linked to the unprovoked attack. 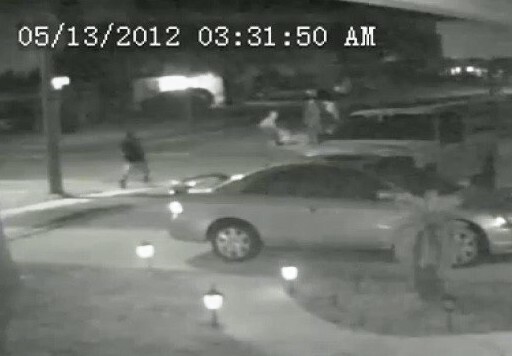 A nearby security camera captured the youngsters beating and kicking the victim, Army Sgt. Johnny Aparicio, who was hospitalized with a bloody, broken nose and a knocked out tooth. The sergeant is with Central Command at MacDill Air Force Base and is relatively new to the area. He was attacked during the early morning on May 13th only a few miles from the base. MacDill Commander Col. Lenny Richoux called the attack an isolated incident and credited the community for its response. Community tips helped lead police to the arrest Friday of suspects Geroshe Lewis, 18, and Lerome Howard, 18, both of Robinson High School in South Tampa. Late Sunday, Jared Richardson, 18, of Brandon was arrested. A fourth suspect is still at large. 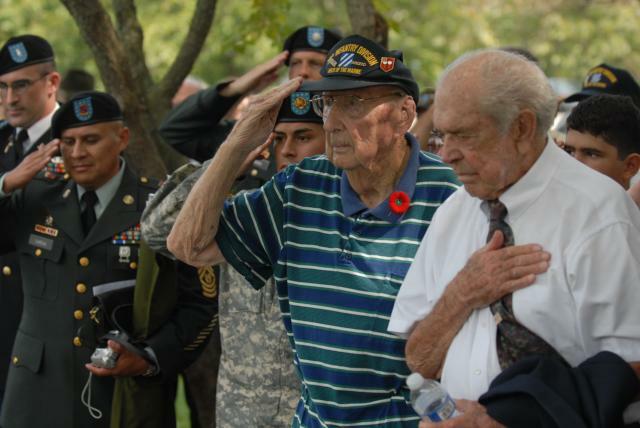 Floyd Kruszka (left) and Darrell Egner, both veterans of Operation Dragoon, salute the American Flag at a ceremony commemorating the 65th Anniversary of Operation Dragoon, at Arlington National Cemetery in Arlington, Va., Aug. 5, 2009. Photo courtesy of Army.mil. Friday is the official – 11th hour of the 11th day of the 11th month which marks the end of hostilities – the Armistice from World War I. Yet many events are planned throughout the week to mark what has become Veterans Day. MacDill AFB – It’s not open to the public, however, the 6th Air Mobility Wing at Tampa’s MacDill Air Force Base and the joint commands located on base will observe Veterans Day at an 8 a.m. ceremony that includes a flyover by a KC-135 Tanker. USF TAMPA CAMPUS: An early Veterans Day celebration is set Tuesday at Tampa’s University of South Florida Campus featuring the Special Operations Parachute Demonstration Team and Keynote Speaker, General Lloyd “Fig” Newton, USAF (Ret). It’s scheduled from 10:30 a.m. to noon at the Martin Luther King Jr. Plaza. HALEY VA HOSPITAL – A parade, antique car show and cookout have become a tradition at Tampa’s VA Medical Center. It’s open to the public and is truly a center where Veterans are a huge part of the ceremony and celebration. The parade begins at 10 a.m. including high school bands, the U.S. Central Command Color Guard, AMVETS Riders and more. BAY PINES VA: A ceremony honoring the men and women who served features the Keswick Christian High School band, a firing salute, taps performance, and military vehicle display is scheduled at 10 a.m. on the Bay Pines Campus. It’s open to the public, veterans and their families. A reminder to all Veterans – if you’d like to share your definition on what it means to be a Veteran – email me at bobrien@wusf.org with your comment before Nov. 10th. The USAF Thunderbirds. 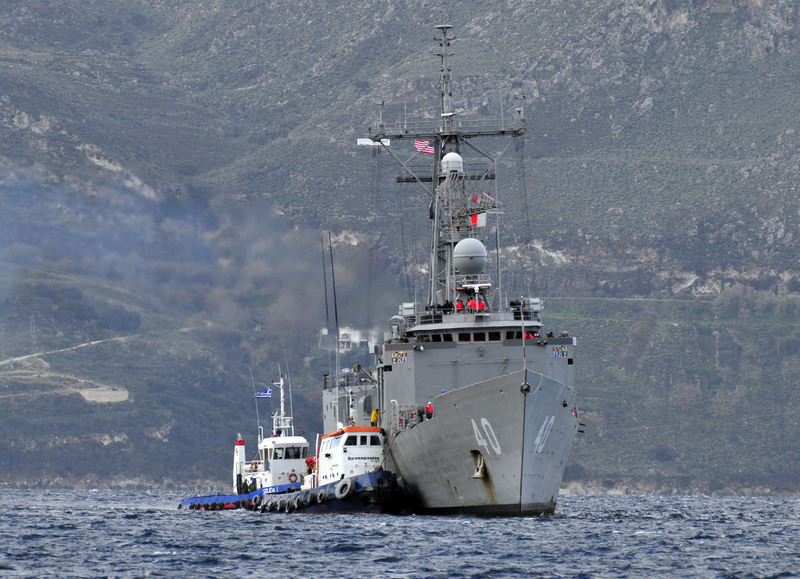 Photo courtesy of the Air Force website. The KC-135 Stratotanker is an everyday sight at Macdill Air Force Base, home to the 6th Air Mobility Wing. But, this weekend the C-135s will have company. The skies over Tampa will be filled with demonstration flights by the U.S. Air Force Thunderbirds, a B-25 Mitchell Bomber and a P-51 Mustang among other aircraft. 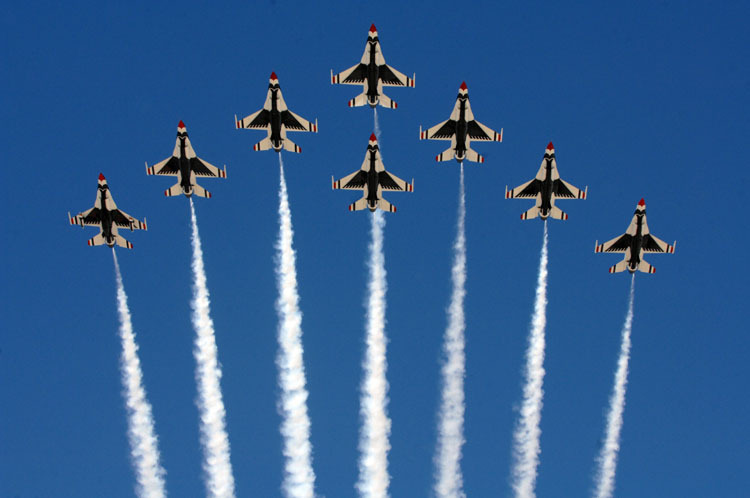 It’s the annual MacDill AirFest is Saturday and Sunday. The gates at Dale Mabry Boulevard and MacDill Avenue open at 8 a.m. to the public with opening ceremonies planned at 9 a.m. both days. Once the spectator parking is full, the gates will close however and the base will only be accessible for the general public by foot or on public transportation. A KC-135 Stratotanker fly-over at 10:20 a.m.
Be sure to check the Frequently Asked Questions page for a list of suggested items to bring and what not to bring.